VARANASI, INDIA - 22 FEBRUARY 2015: People bathing in the Ganges river in Varanasi. 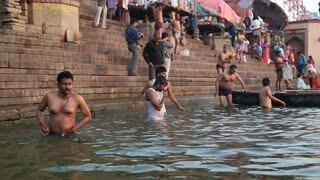 VARANASI, INDIA - 22 FEBRUARY 2015: Men bathing in the Ganges river in Varanasi. VARANASI, INDIA - 22 FEBRUARY 2015: People at ghat of Ganges river in Varanasi at sunset.